GENUINE HONDA FD2 RRC piston set. To fit the vehicles below. Let us know if you need to check fitment to. Genuine Honda FD2 piston set. These are perfect for naturally aspirated all-motor applications. These Civic FD2 Type R RRC pistons are of a high-pressure die cast construction. It has a black dry molybdenum film lubricant coating on the skirts for longer wear and less friction, as well as additional oil holes in the ring grooves for better high rpm oil control. These pistons also have holes in the wrist pin bosses to improve wrist pin oiling. When installing these pistons, care must be taken to ensure the correct final compression ratio is achieved, and that no interference will occur. Complete with new wrist pins. If you need to order any other HONDA genuine part please send me a message and i will come back to you asap with a quote. Keep your HONDA, a HONDA! 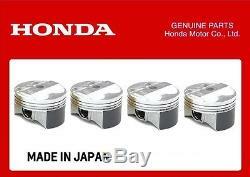 The item "GENUINE HONDA CIVIC TYPE R FD2 K20A PISTON SET RRC K20A K20A2 K20Z4 K20Z3 K20Z1" is in sale since Thursday, February 4, 2016. This item is in the category "Vehicle Parts & Accessories\Car Parts\Engines & Engine Parts\Other Engines & Engine Parts". The seller is "mlc-r" and is located in CHIBA. This item can be shipped worldwide.